Everything continued to go well! At 10 weeks, It was a Monday… August 2nd.. I was FINALLY going to get my first ultra sound and get to see my baby and its beautiful little heart beat for the first time… Or so I thought.. As I entered the room, the ultra sound tech right off the bat gave me the creeps, and as we did the ultra sound I automatically knew something was not right. I had seen so many ultrasound pics from other gloating mothers, that I had an idea of what I THOUGHT I was going to see! Instead, I saw what looked like a “white out” like when the tv gets all white and fuzzy. And the ultrasound tech could not tell me anything and just made me very uncomfortable. He told us to go sit in the waiting room, he had to have a member in radiology look over the tape. As we left the room I automatically texted my awaiting mother and told her that I didn’t think it was going to be good news. and I started to cry. Chris, being the wonderful man that he is, just told me to stay positive! and maybe the tech didn’t know what he was doing… 20 mins later it is now 4 pm. and the tech comes into the waiting room and tells me that He has spoken with my Dr. and she would like to see me right now to go over the ultra sound. Well.. I’m not stupid I can put 2 and 2 together Something is not right, my dr. office CLOSES at 4 and for them to stay late to see me, something has got to be wrong.. So we drive across town and I try to keep myself composed as we walk into the office. My dr. sits me down and says that I have either had a missed miscarriage, or she is afraid that I have had what they call a “molar pregnancy” a very rare issue that happens, and that I need to go have blood work done to determine whether I have this or not, and it needs to be done right away because it is dangerous to me, and if not treated can lead to a form of cancer. At this point I’m “hoping” for the missed miscarriage and that I will be able to go home, and handle it naturally as I had in the past. So again, we drive across town, and have my blood tested at the lab and come home finally to try and process what we had just been told. I had no cramping, no bleeding, and all my pregnancy symptoms that I had had all this time. I just cried and cried and waited for my body to naturally start passing the baby. Two days later I get a call from my dr. and she tells me that my HCG levels are through the roof, and that would indicate to her a molar pregnancy, She wants to call a specialist and see what she thinks and will call me back. So at that point I start panicking because I don’t know what this means, I know that I am home alone with no car; My boyfriend travels for work and was 3 hours away that day, my parents live an hour away and I just didn’t want to be alone so I called my mom in absolute hysterics and she tells me that her and my daddy are on there way ( yes I’m 26 but I still wanted my mom and daddy) So before they get here the dr has called me back and told me that the specialist wants to see me ASAP it is her day off but she is heading into to office and wants to do a d&c right then and there.. I was so soo scared and looked up a d&c procedure to find out what they actually did, I knew what it was but didn’t know what it entailed so to speak, I see that they put you under for this and that scares me as I’ve never been put under before..
Fast forward, My parents get here, I go to this specialist who I’ve never met before, and she takes me into this room, and there are friggin saftey glasses hanging off the wall!! I’m thinking Oh my god what are they going to do to me?!?! and the dr. is telling the nurse that she needs to get bigger tubes, because I’m further along and the “stuff” will get stuck in the smaller tubes… I’m laying there trying to zone out and I’m waiting for them to give me anestetics or whatever so I don’t feel anything, and they tell me basically its going to hurt like hell and the nurse will hold my hand.. I was awake through the whole thing and it was probably the most intense pain I’ve ever felt and I don’t think I will ever forget the noise of that machine. After it was said and done, The dr. explained to me that I would have to have weekly blood test done to monitor my blood levels, to make sure the HGC is going down.. She also told me that it is such a rare thing that drs. themselves don’t really know a whole lot about it, other then after I reach Negative on my counts I am to NOT get pregnant for at LEAST 6 months and schedules me an appt. to get an Implanon insertion for birth control. So many people don’t understand how scary it is to be told you have a molar pregnancy, they just assume that it is like any other miscarriage, But it is not. We have a long road ahead of us after we reach our negative point which some of us, undergo Chemo to help them get to that point, and others such as myself have reached that point on our own. The good news is, That starting today. I have 2 weeks left of weekly blood test, and then I will go to monthly, to make sure that it does not come back ( again, molar pregnancies act like a cancer and can spread to any part of the body, and can come back) And as long as I remain at a negative point. Today starts my 6 month count down to when We can try to have a baby again! I hope that maybe they’re are other ladies here that have had a molar, that will take some sort of encouragement in knowing that they are not alone, Like I thought that I was, and there is hope for us!! This was my second lost child and the pain is awful and to this day I still have my days that all I can do is cry. There is nothing I could have done differently to save my lil sea monkey, All I can do now is get myself back to normal, and be strong, and try to give him or her a brother or sister to watch after. I too have just had a D&C July 28th for a molar pregnancy. My story is similar to yours. The spotting, u/s and meeting with the dr. He however let me do the procedure that following day. I understand how scary it is. I have to do blood test every month as well. It is scary (especially if you hate needles like me!) I am so sorry for your loss and we both will over come this. God bless you! Just noticed your reply Im sorry.. I am hoping that everything has gone smoothly for you, and you are on your way, if not already holding your little rainbow baby!! I am so sorry, I had a partial molar and with the blood tests as well. Our next pregnancy was a success. Hoping for a wonderful outcome for you. I am so sorry that you had to go through this. 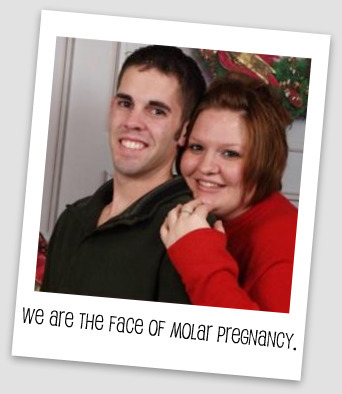 I had a molar pregnancy march '08 and my story is very similar to yours. Hope you find your rainbow!